Let the Eternal City enchant you as we drive through the picturesque storehouse of art and discover some of the world's most famous sites such as the Pantheon, Piazza Navona, Trevi Fountain, Spanish Steps, Colosseum, Roman Forum, Palatine Hill, Aventine Hill, Capitoline Hill, Theatre of Marcellus, Circus Maximus, Aurelian Wall, Piazza Venezia and the Monument to Vittorio Emanuele II, the memorial to the 1st king of Italy. 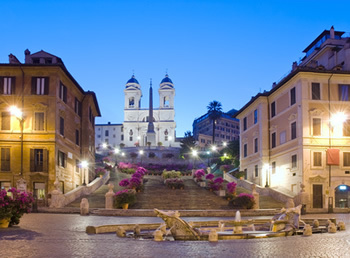 You can climb the steps of the Capitoline hill and enjoy a beautiful view of the Roman Forum. 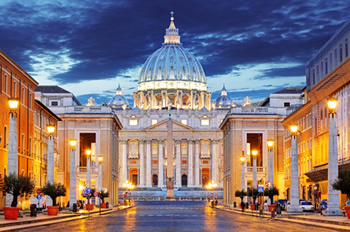 The tour will continue on to visit St. Peter's Basilica, famous as a place of pilgrimage, for its liturgical functions and for its historical associations. It is associated with the Papacy, with the Counter-reformation and with numerous artists, most significantly Michelangelo. As a work of architecture, it is regarded as the greatest building of its age. Contrary to popular misconception, Saint Peter's is not a cathedral, as it is not the seat of a bishop. It is properly termed a Papal basilica. The Vatican Museums, an amazing home to art, culture and history, not to mention Michelangelo's frescoes in the Sistine Chapel, is the center of Catholicism. The Basilica of Santa Maria Maggiore is dedicated to the Virgin Mary and is an extraordinary witness of Early Roman Christian art with wonderful mosaics, a magnificently decorated golden ceiling and the tomb of Bernini. The Basilica of St. John Lateran is the most ancient basilica, built by Emperor Constantine, and was the first residence of the Popes until 1307. It is the cathedral of the Church of Rome, with wonderful seventeenth century renovation by Borromini. The Baptistery and the Holy Stairs of Christ's Passion, the oldest and tallest among the 13! We will point out the various Egyptian obelisks in Rome. Finally arriving to the Catacombs of St. Callisto and St. Sebastian, which are on the ancient Appian Way. The present catacombs are a series of underground galleries and vaults of various sizes. These were holy sites where Christians buried their dead and came to pray and celebrate liturgy. On the way back to the hotel, you will see the Baths of Caracalla, which were one of the largest thermal spas of antiquity, perhaps the richest in the splendor of its decorations, which were built entirely by the emperor in 212 AD and which operated up until 537. 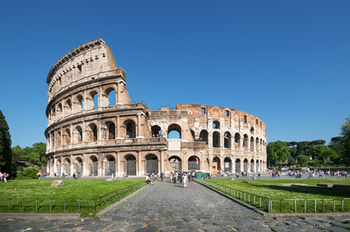 Now, once again, Rome has become an important and romantic place for visitors to learn about the Roman Republic, the Roman Empire, Medieval Rome, Renaissance Rome, Italian unification (Risorgimento), and its early Christian past. Duration of this daytrip: 8 hours. We also recommend to pre-purchase your Coliseum tickets online (if you wish to enter) for the same reason. Make this reservation between 9.30-10 AM if you plan on visiting inside.